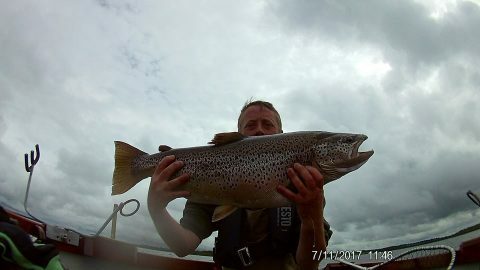 Athlone angler had a day to remember fishing for the big, wild brown trout of Lough Ree, boating two in double figures including this 17lb 2oz brute. Earlier in the day while trolling, Stephen, who no stranger to catching them, boated a 13-pounder. Both cracking fish were released. The Irish Fisheries Board is currenlty promoting its catch and release initiative – #CPRsavesfish. This campaign highlights angling and the importance of conservation. The hashtag #CPRsavesfish has been placed at a number of bridges and other locations across the country to engage the public around the pursuit of conservation focused angling. “CPR angling is proven to contribute to the maintenance of healthy fish stocks and helps to ensure future generations will continue to enjoy the sport we love so much,” said a spokemsman for the Fisheries Board.